IPA Project “Increasing the competitiveness of the domestic small and medium enterprises with the objective of improving their cooperation with the foreign investors“ - Possibilities and challenges”. 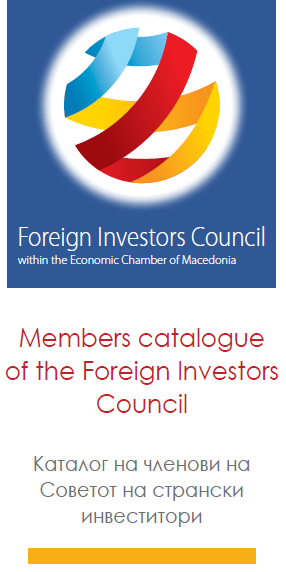 The Foreign Investors Council and the Economic Chamber of Macedonia, together with the Faculty of Mechanical Engineering within Ss. Cyril and Methodius University in Skopje, won a Project entitled “Increasing the competitiveness of the domestic small and medium enterprises with the objective of improving their cooperation with the foreign investors“ - Possibilities and challenges”. The project is financed by EU funds, within the Instrument for pre-accession assistance (IPA) and is implemented in partnership with the Vienna University of Technology- Institute for management and science and is supported by the Government of the Republic of Macedonia that is committedly encouraging this kind of cooperation. The aim of the project within next 24 months is improving the production capacities of local companies with the objective of increasing their competitiveness and the innovative capacities for better cooperation with foreign investors in the country and to be able to be included in the supply chain. The Conference for strengthening the cooperation between foreign companies and local companies that have the potential to become their suppliers, organized by the Foreign Investors Council, together with the Faculty of Mechanical Engineering within the SS. Cyril and Methodius University in Skopje took place on 20.04.2018 in Holiday Inn in Skopje. The benefits of the foreign investments in a country include, first and foremost, direct creation of new jobs and generating income, increase of the export and its diversification, inflow of foreign capital in the form of foreign direct investments and creating added value in the economy. The indirect effects are rather more complex and their importance to the greatest part is manifested via their long-term contribution to the economic development. The structural transformations of the economy are considered to be one of the most important ones, as well as the promotion and increase of the openness, indirect job creation and the transfer of technology and upgrading the skills of the workforce.